Grumpy Cat feels vindicated and is somewhat pleased. Her owners have won a $710,001 jury verdict in California, against a coffee maker that exploited their copyrights. The bulk of the damages were awarded for copyright and trademark infringement, with a symbolic $1 in nominal damages for contract breach. There are dozens of celebrity cats on the Internet, but Grumpy Cat probably tops them all. The cat’s owners have made millions thanks to their pet’s unique facial expression, which turned her into an overnight Internet star. 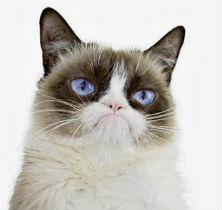 Part of this revenue comes from successful merchandise lines, including the Grumpy Cat “Grumppuccino” iced coffee beverage, sold by the California company Grenade Beverage. The company licensed the copyright and trademarks to sell the iced coffee but is otherwise not affiliated with the cat and its owners. Initially, this partnership went well, but after the coffee maker started to sell other “Grumpy Cat” products, things turned bad. The cat’s owners, incorporated as Grumpy Cat LLC, took the matter to court with demands for the coffee maker to stop infringing associated copyrights and trademarks. “Without authorization, Defendants […] have extensively and repeatedly exploited the Grumpy Cat Copyrights and the Grumpy Cat Trademarks,” the complaint read. After two years the case went before a jury this week where, Courthouse News reports, the cat itself also made an appearance. The eight-person jury in Santa Ana, California sided with the cat’s owner and awarded the company $710,000 in copyright and trademark infringement damages, as well as a symbolic $1 for contract breach. According to court documents, the majority of the damages have to be paid by Grumpy Beverage, but the company’s owner Paul Sandford is also held personally liable for $60,000. The verdict is good news for Grumpy Cat and its owner, and according to their attorney, they are happy with the outcome. A copy of the verdict form is available here (pdf).